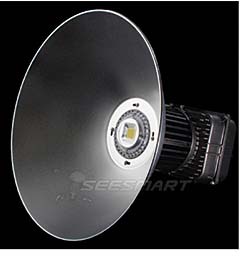 LED Day White LED High Bay is a 100-watt LED that replaces 100-400W metal halide or high-pressure sodium lamps. Lamp is instant on/off with no noise and no flickering with a lumen efficacy of 75.27. Light produced has a CRI of 70 with a color temperature of 5,500K to 6,000K. Lighting angle is 140 degrees. Aluminum lens reflector style and hanging hook base. Working voltage is 120-277VAC and operating temperatures range from -40 to 130 degrees F.